Belle Grove is a feel-good mystery novel with just the right amounts of drama, thrill, and heart. In the second installment of the Corsica series, Libby Langston once again finds herself drawn to long-buried secrets in the little town by the sea. 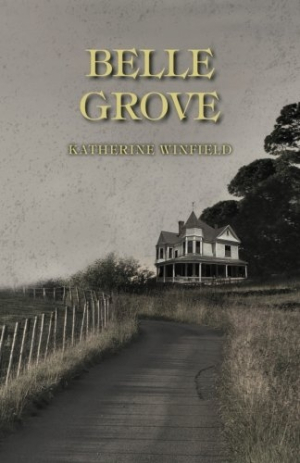 With tasteful doses of suspense, intrigue, and relief, Katherine Winfield’s Belle Grove encapsulates a quest for truth that tests the bounds of friendship, family, and love. A mysterious couple moves into the old Kellum farm, rousing the sleepy town’s residents from their routine lives. Despite the sense of unease that Sonia and Michael bring to Corsica, the newcomers find a place in the community—until a murder turns friends into suspects and lovers into strangers. As the characters grapple with the chain of events that the murder sets in motion, each must come to terms with themselves before they can find the murderer out. Winfield is deft at keeping suspense simmering on the back burner while developing a set of characters so real and complex that they’re easy to both love and reproach. It’s hard to sympathize with just one character in Belle Grove; each, with their explored needs and desires, serves as a study of human nature at its most raw. Even Libby Langston, the apparent protagonist, isn’t immune to the struggles and temptations of everyday life: fleeting jealousy, moments of lust, doubt in the things she trusted most. Instead of building up Libby as an infallible heroine who solves the crime, Winfield spends time drawing her as human; she serves as a continual reminder of flawed humanity and of the the need for acceptance. Multiple story threads come together in a carefully woven plot. Chapter by chapter, the focus shifts from one character to another. There’s Libby, whose inability to let go of the past is obstructing her life in the present. Julie, Libby’s best friend, faces a failing business and crumbling marriage on top of suspicion for murder. For Tabs, a character who considers Libby somewhat of a mentor, it’s about coming to terms with herself, finding young love, and most importantly, discovering the identity of her father. Each narrative feels as if it’s the main. Instead of pulling the story in many different directions, however, the threads come together to form a bigger picture that isn’t evident until the end. Belle Grove reads at a fast pace, with quick rising and ebbing of tensions and action. The novel is grounded in the town of Corsica, portrayed as a haven, despite the murder that occurs. As a result, there is an underlying feeling of safety and a permeating sense that everything will be all right, despite the tensions that enter the fold. Even the most unfortunate occurrences can’t budge the core of the seaside community. It’s this reassurance that keeps the overall aura of the book light, without bringing any of the mental fatigue that often accompanies heightened tensions or actions. The book maintains a levity and brightness rare for its genre. Instead of darkening tones to amp up drama, the ends of chapters are clipped to build suspense. This builds a curiosity that keeps the pages turning. Belle Grove is a feel-good mystery novel that doles out its elements well: just the right amounts of drama, thrill, and heart.